Minion wave control is a fundamental skill in League that Cloud9’s rookie has mastered. Minion wave management is one of the the most basic skills in League of Legends. Even bronze players know that you should shove a wave before recalling and freeze a wave when behind. But the intricacies of how exactly to play out lanes against a huge variety of champions can get the best of even seasoned pros. Cloud9’s Eric “Licorice” Ritchis is in just his first split on the LCS level, and yet he’s shown strong management technique in a variety of matchups. His ability to play the map and play with his team is a big reason why Cloud9 are still a top team this year after losing previous top laner, Jung “Impact” Eon-yeong, one of the most highly paid players in the league. We took a look at some situations where Licorice’s wave management has helped him win lane and carry his team. One of Licorice’s biggest games of the split came a couple weeks ago against Clutch Gaming. Not only were Clutch in playoff contention, but they also had a rookie top laner, Colin “Solo” Earnest. This would be a great test of Licorice’s skill against someone of a similar experience level. Licorice took an off-meta pick in Kled, hoping to bully Solo’s Sion and become a split-pushing fiend. But Clutch weren’t going to take the beating sitting down. Both junglers headed to top lane after their first clears. Licorice needed his jungler to help him shove and get an early recall. Because Solo’s Ornn could build items in lane, setting up Licorice’s recalls would be critical for Cloud9. But Clutch’s Nam “LirA” Tae-yoo was there too, and that meant Cloud9’s duo were unable to fully complete the shove and get their minions into the Clutch tower. That handed control back to Solo and he almost picked up a solo kill with the minions on his side. Licorice stayed alive, recalled, and teleported back to a minion, however, keeping the wave out of his tower range. Then he set up a beautiful freeze by waiting until the last moment to attack the minions. Four minions are what you need to freeze the lane. As long as four minions from the opponent’s wave stay alive when all of the allied minions from the wave due, the wave will be kept in the same position. It’s easier to do this with caster minions because melee minions are idiots—a lot of the time, they’ll wander under the turret screwing up your freeze. Licorice didn’t screw it up. When Dennis “Svenskeren” Johnsen’ rode back in a few minutes later, because of where the wave was, Solo was dead before he knew it. A fed Kled meant game over for Clutch. Licorice’s wave management helped Cloud9 win the game. It’s fun when you have a frozen lane and jungle help on the way, but that doesn’t happen every game. Sometimes, opponents will get jungle help and take control. The most important thing to remember in these instances is to not panic. Losing a few minions is okay, even a full wave. But as long as you communicate with your team and receive jungle help, every situation is salvageable. A week before that Clutch game, Cloud9 faced TSM and veteran top laner Kevin “Hauntzer” Yarnell, one of the best in the region. Hauntzer was able to freeze the lane early and with minions pushing for him, Licorice had no choice but to extend past the river. That doesn’t mean he had to be an idiot about it though. He smartly dropped a pink ward in the river brush to deny TSM vision. And while he couldn’t prevent his wave from slow pushing out, he played it extremely carefully, only stepping forward when absolutely necessary. Finally, Svenskeren knew that Licorice needed help pushing and was on the top side of the map. That set up Licorice for an amazing escape. Licorice lives and Svenskeren shows up just in time for Cloud9 to pick up two kills! With mid and bot losing, it was just what they needed to completely turn things around. 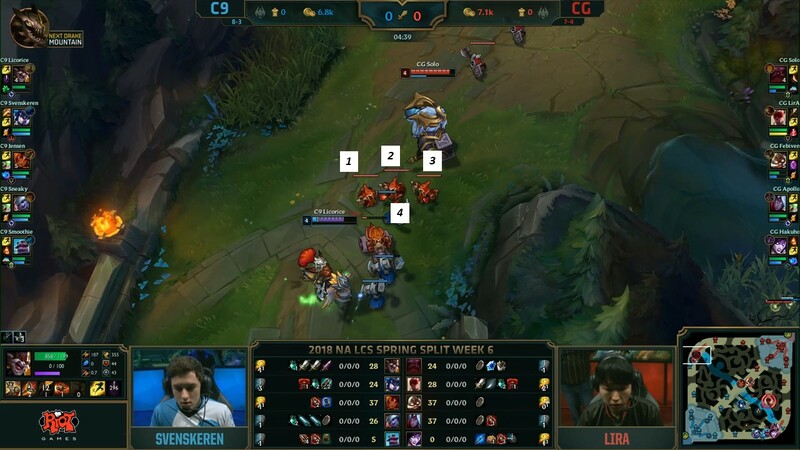 If Licorice had died there, the game very well might have been over with Cloud9 facing three losing lanes. With just a week left in the split, Licorice has the Rookie of the Split award all but sewn up. He’s been everything he was advertised as following his run in the Challenger Series. He still has things to improve on. The best top laners in the region, including Hauntzer and Echo Fox’s Heo “Huni” Seung-hoon, can still get the best of him. He might still have nightmares from the way Huni abused a lane freeze against him in their last meeting. But the future is bright for this kid. If he can keep playing solid fundamental League, with the occasional flair for the dramatic outplay, he could help set up Cloud9 for years of competitive success. Their previous projects, including Nicolaj Jensen and Andy “Smoothie” Ta have turned into absolute stars, perhaps the best at their positions in NA. 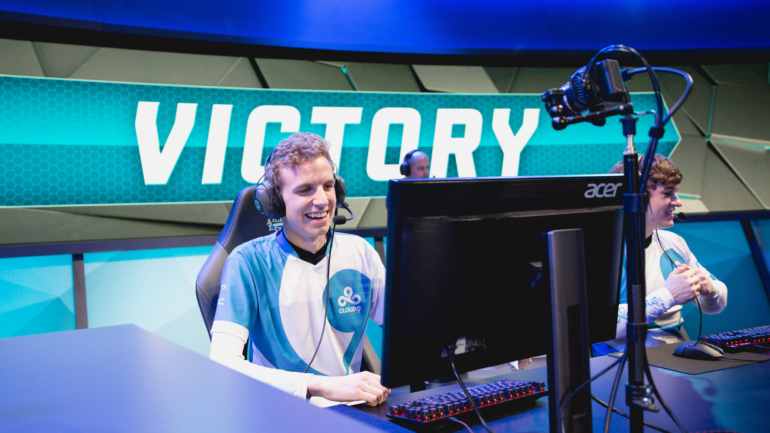 If Licorice keeps improving, he could join them as Cloud9’s latest success.